The history of this bread is a real detective story. Even the name of its real inventor remains a mystery: The recipe is simultaneously attributed to a disconsolate aristocratic widow, a famous professor, a chemist and a composer and two Latvian communists. 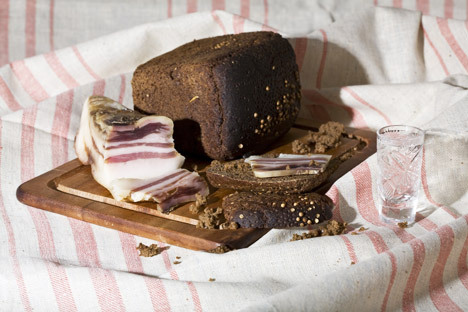 Borodino bread is one of the most famous varieties of Russian rye bread, whose dark chocolate tint and characteristic sweet-and-sour taste and spicy aroma are known to every Russian citizen from childhood. Black bread baked from almost pure rye flour is not too common in Europe: Soviet propaganda generally argued that they did not know how to bake in the West; although the Germans, with their famous pumpernickel, can laugh at this claim. Borodino bread is remotely similar to this Northern European rye product and is made using sophisticated production technology. The bread is boiled — that is, rye flour with the addition of a small proportion of wheat — before the batch is brewed with boiling water and allowed to stand for several hours at a certain temperature. Ingredients include golden syrup, which is not popular in other Russian dishes, and red rye malt. In the last stage, the bread is flavored with coriander seeds, and this is an indisputable local taste: In Northern and Central Europe, if the bread is to be spicy, anise or caraway is used. Among the dozens of varieties of Russian black bread decorated with a golden crust of coriander seeds, Borodino bread is one of the favorites. Coriander is associated with the most romantic version of the origin of Borodino bread. Its round seeds are supposed to resemble case shot bullets, which lacerated the body of the brave Gen. Tuchkov, who led his musketeer regiment in the attack at the Battle of Borodino. The general’s widow, unable to find her husband's body on the battlefield, built a monastery on the supposed site of his death and later became the monastery’s abbess. Subsequently, the famous bread was baked at the monastery’s bakery, which quickly found its way from Mozhaisk to Moscow, conquering the capital. Borodino bread’s round seeds, which carry both a warm and slightly cool taste, are a tribute to the brave aristocrat. Other sources say this bread was invented by the famous Professor Borodin during his trip to Italy, where had borrowed a local secret recipe from someone. That is why the bread is called Borodino. The professor was not only an outstanding scientist but also a great composer, who wrote one of the best Russian operas, "Prince Igor." Yet, to find a typical northern bread culture such as rye — or even a recipe based on it — in a sunny, 19th-century Italy was probably too much for even such an extraordinary man. Finally, there is another version, whose proponents claim that Borodino bread was already invented in Moscow by two Latvians bakers — comrade Spredze and comrade Zakis — who worked in Bakery №159. According to this version, Borodino was baked in the 1920s and only in Moscow: This is when Borodino bread became widely referred to in the written sources (namely in Spredze and Zakis’ recipes) and was included in the Soviet list of standard recipes, spreading across the country. The place where Spredze and Zakis acquired the recipe remains a mystery. Perhaps this invention had German influence, because, in Moscow and in Russia, it was traditionally the Germans who were mainly engaged in baking: The Latvians could learn from them, adopt something and perfect it. However, this is only a hypothesis and will remain one. Borodino bread remains a mystery. By tradition, soup is always served for lunch at the Russian dinner table: Borodino fits in perfectly with the taste of the most common of soups — borscht — which is also sweet and sour. Their sweet and sour flavors complement each other perfectly. Borodino bread also is not bad when served as a snack with vodka — especially in combination with Russian herring fillets in a marinade that also includes coriander seeds. Finally, at breakfast, in combination with the cup of strong black tea that is usually had in the morning in Russia, Borodino bread is also appropriate — a universal food that is good to eat with everything, even with its murky past and mysterious destiny.